The Woven Wallet when closed measures 5 inches’ tall x 4 inches wide x .50-inch depth; when opened the Woven Wallet measures 8 inches’ x 4 inches. The inside of the Woven Wallet is lined with indigo fabric containing alternating white stripes. The Woven Wallet includes a billfold, zippered coin chamber, three card slots, and a Velcro closure. The outside of the wallet is adorned with the signature brocade weaving of Todos Santos and a .25-inch black liner is sewn around the brocade weaving that accents the wallet. The Maya Hand Woven Wallet is beautiful, functional and stylish! 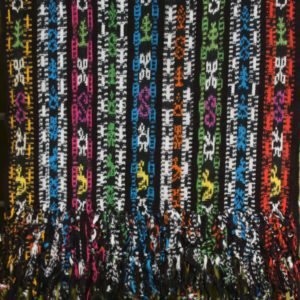 Each Maya Hand Woven Wallet is made from the beautiful Todos Santos woven fabric, traditionally woven for women´s blouses or men’s shirts, and the two outer side of the wallet has the beautiful signature brocade weaving of Todos Santos. Every Maya Hand Woven Wallet is finished to Francisco’s high standards including internal bound seams. $18.00 Add to cartAdded to cart! $70.00 Add to cartAdded to cart!